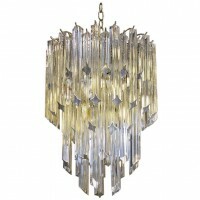 Gorgeous Venini multi-tier Triedi crystal prism chandelier with brass frame. Total length with chain and canopy 45″ can be adjusted as needed. Newly wired.